Thanks to atmospheric circulation and other factors, the mercury that we deposit into the environment tends to accumulate in the Arctic. Mercury exposure can reduce birds' reproductive success and sometimes even be lethal. Shorebirds may be particularly vulnerable because they forage in aquatic environments where mercury is converted into methylmercury, its most dangerous form. 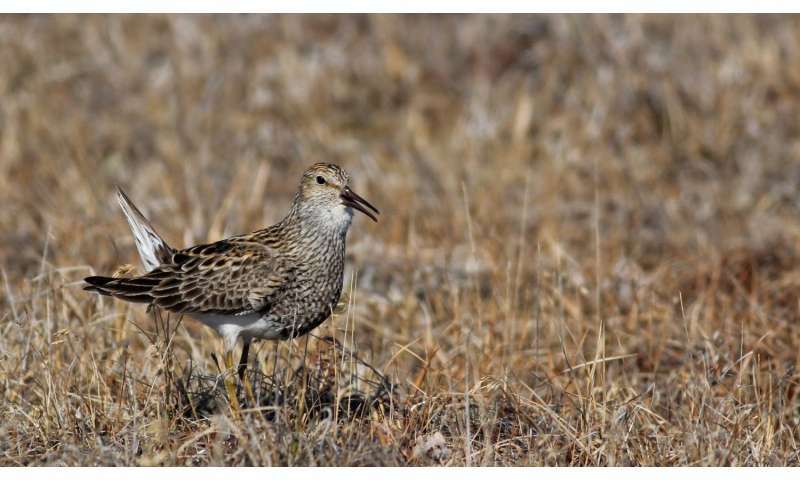 Marie Perkins of the Biodiversity Research Institute (BRI) and her colleagues investigated the level of mercury in Alaska's shorebirds and found that some birds breeding near Barrow, at the state's northern end, have mercury concentrations upwards of two micrograms per gram of blood. "These species already face a lot of tough new challenges, from climate change to disappearing stop-over habitat, so throwing a neurotoxin in the mix that can reduce reproductive success is likely to harm their populations," according to Dan Cristol of the College of William & Mary, an expert on mercury in birds who was not involved with the new study. "The mercury concentrations reported in this paper are likely to reduce reproduction, but not catastrophically, based on what we know from other species. What may be even worse, though, is that these mercury levels probably spike when they leave the breeding grounds and start burning their reserve fuel, making their already arduous continent-jumping trips even harder." To assess the birds' mercury exposure, Perkins and her colleagues collected blood and feathers from nine shorebird species breeding and staging for their southward migration at sites throughout Alaska. In addition to the troubling results from birds breeding near Barrow, they found that mercury levels depended on a species' foraging habits—shorebird species that foraged in upland areas, away from methylmercury-rich wetlands, had the lowest blood mercury concentrations. More work is needed to determine how much mercury various shorebird species can handle before they suffer adverse effects. "These results have encouraged me to expand my research on mercury exposure in Arctic shorebirds," says Perkins. "I am currently pursuing my PhD at McGill University, where I am working in collaboration with BRI and the Arctic Shorebird Demographics Network to closely examine mercury exposure in multiple shorebird species breeding across the North American Arctic." Nothing like they were during the height of the gold rush. The world didn't end then, either.